Do you really need an intranet portal for workplace collaboration? It seems like workplace collaboration has truly matured over the past decade. Intranet portals, which is still prevalent among enterprise organizations, don't seem relevant anymore. But is that truly the case? Workplace collaboration is a massive industry in 2018. Tools like Slack, Trello and Wrike have made the job of sharing ideas and managing projects quite seamless and efficient. Skype and Google Hangout make video conferencing with your offshore colleagues simple while services like Apple iCal and Google Calendar help you manage your schedule. At the outset, it seems like workplace collaboration has truly matured over the past decade. Intranet portals, which is still quite prevalent among enterprise organizations, do not seem relevant anymore. But is that truly the case? Collaboration defragmentation is a serious hindrance to productivity in small and medium sized businesses. The average SMB uses anywhere between three to six tools for collaboration with their teams. This could include tools like Google Drive and Dropbox for file sharing, Slack and Trello for project management and Apple iCal for appointment scheduling. Defragmentation is a reality even within specific areas of collaboration. It is not uncommon for someone use a tool like Trello to collaborate with one department and use Slack to work with another. This can be a problem since there is no real way for information to seamlessly flow from one department to another without manual intervention. Take the example of a marketing manager who needs to pass on the details of a qualified lead to her sales counterpart. In a unified collaborative environment, all that the marketing manager has to do is tag the sales manager to the lead. In turn, the sales manager tags one of her executives to own this lead. But what happens most often is that the marketing manager uses a tool like Google Sheets or MS Excel to share the lead with her sales manager. The sales manager then copies this data to her CRM for the sales executive to take over. Such minor inefficiencies in the system can quickly add up due to collaboration defragmentation. One reason why collaboration defragmentation exists in small and medium businesses is simply because such organizations can afford to commit such productivity blunders. 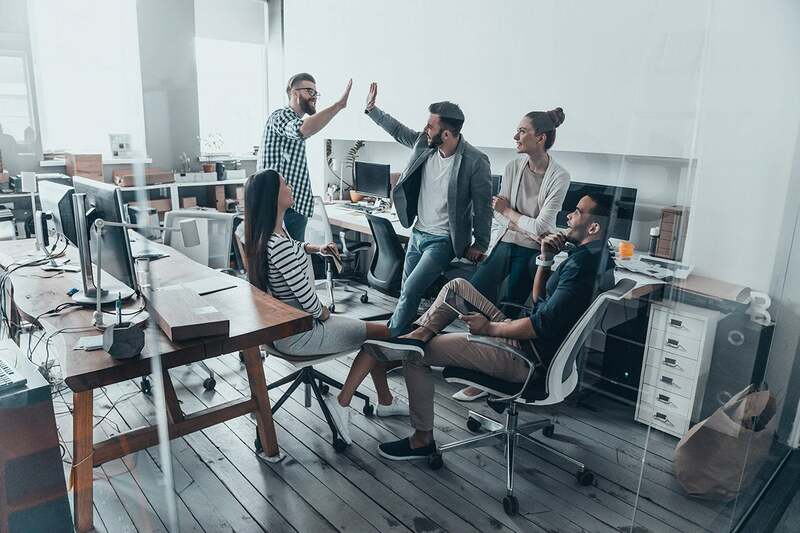 Large enterprises with dozens of departments and thousands of employees need better processes to handle workplace collaboration. Such organizations deploy intranet tools including collaborative tools like SharePoint to host multiple collaboration tools under one dashboard. This helps bring the entire organization under one roof and makes transmission of data from one department to another seamless. Let us see how this works. If you are a SharePoint user, you can set up a Microsoft Office 365 intranet portal for your business. This portal provides the user with individual workspaces while allowing them to access a host of different collaborative tools like MS Office (for document sharing), Skype (for video conferencing), Yammer (for task collaboration), Outlook (for emailing), Bookings (for appointment scheduling), StaffHub (for staff communications) and so on. Since all this information is handled under one login, it is easy for a marketing manager in the earlier example to access the same CRM tools that the sales manager has access to. Transmitting lead data from the marketing to sales now happens with very little manual intervention. Besides the productivity aspect of it, intranets also make sense for other reasons. One important reason is scale. A 10-member team could be spending as much as $100 a month just on a project management app like Wrike or Basecamp. Add to this the cost of other apps for business needs like appointment scheduling, CRM and emailing, and the price can easily add up to several hundreds of dollars. An umbrella solution like Office 365 Intranet can cost around $200 for the same ten person team and comes with a productivity boost. It is worth pointing out that one reason collaboration defragmentation exists is because it can be cheaper for organizations. There are free tools to perform several of these collaborative tasks and for a bootstrapped business, such free tools can be a god-send. When you are just starting out, it may seem like a good idea to use free resources even though this can be a hindrance on your productivity. This is true for start-ups with under 10 employees. However, as your organization scales and your employee count reach the double digits, it is important to focus on productivity improvements. Investing in an intranet that can consolidate all your collaboration tools under one umbrella can be quite important at this point. To conclude, organizations must also note that an intranet alone cannot solve productivity blunders at the workplace. Small businesses do not invest adequate resources in employee training and this can lead to partial or ineffective use of intranet tools. In the absence of established processes, employees tend to slip out of the official collaborative network and may start using free third-party tools to collaborate. To improve intranet ROI, effective training systems and workplace processes are thus key.